When I was pregnant with my first son, Isaac, a little over three years ago, I was what would best be described as your typical Type A overachiever. There was never a list not checked off, a career goal unmet, or a problem that couldn’t be solved without a good spreadsheet. As a competitive woman in a corporate world, I approached Isaac’s impending birth in a similar way. Get in there, get it done, and then move straight into a picture-perfect life with a gorgeous newborn in tow. When the day came and I reached seven centimeters dilation after 20 hours of active labour, I figured that my body simply wasn’t doing what it needed to do successfully enough. So I called in the anaesthetist (as I had fully planned to), embraced the epidural, and pushed out my beautiful baby boy a few hours later. Job = done. As those early newborn days rolled into one another (combined with painful stitches, the worst constipation I’ve ever experienced, and a short stay in the special care unit for Isaac), as much as the cliché pains me to type, something in me shifted dramatically. It wasn’t that I felt different (although I did), it was that I had a newfound wonder at what my body had managed to create and sustain. Isaac came into the world so perfectly formed, and continued to grow and thrive as he fed like a little milk monster (which later resulted in the most divine rolls of chubbiness known to man). All as a result of really no effort on my part. I couldn’t (and perhaps still can’t) quite believe that as someone who had always pushed myself and my body to achieve, this absolute miracle had been created by itself. Over the course of the next twelve months or so (as I fell more and more madly in love with Isaac every moment), this shift in the way I understood myself, my body, and my world fundamentally changed the way I viewed everything. While I remained deeply ambitious, I quit my corporate job to start my own business so that I could spend time with Isaac. I began yoga. I took on clients in more holistic fields and opened my eyes to a slightly different world. Though it sounds idyllic, it certainly was not without its challenges (extreme sleep deprivation and way too much work for a new mother to name a few). However, at the end of the day, I had started down a path that was one of a little more mindfulness, self-love and perspective. So when I fell pregnant with my second son (after adevastating miscarriage which served to embed these principles even more strongly into my life), I began a quest to learn as much about natural birth as possible. I had absolutely no regrets about Isaac’s birth – it was one that I still look back on with complete love and joy – but I wanted to explore what my body was truly capable of. Never one to do anything by halves, it turns out that I decided to really put it to the test! With my pregnancy came a bout of deep vein thrombosis – resulting in daily injections into my stomach, a hernia in my groin, and the final straw, obstetric cholestasis in my 37th week. Apparently extremely rare (particularly for a second-time mama), it meant that we needed to get our little boy out earth-side as quickly as possible. So on a Saturday afternoon, after a call from my OB sending me straight into the delivery suite, we tearfully dropped Isaac off with my parents, and headed into hospital for an induction. Like all good Type A personalities, I’d of course completed a recent bout of 2am Google stalking about natural births following inductions. The results weren’t pretty. I knew that the hormones released naturally in labour wouldn’t be there to help me through the tough moments, and that I’d be against the clock to deliver, which increased the likelihood of a caesarean section. I didn’t lose all hope, but my priority shifted to make sure we delivered a healthy baby, so I put my birth preferences to the side and handed myself over to the hospital. My induction began at 6pm with an uncomfortable stretch & sweep and insertion of prostaglandin, which didn’t do too much. Over the 12 hours that followed, I felt only minor pangs of pain (just enough to keep me awake – although that could also be attributed to a bit of anxiety), and so at 7am, my obstetrician came in to break my waters after seeing that I was only 3cm dilated. Again, it was uncomfortable but not awful, and I eagerly awaited the contractions to begin. It seemed that our little boy really didn’t want to emerge, as the eight hours that followed were remarkably uneventful(apart from the amount of water that came out of me – no one talks about how much water there really is!). I squatted, bounced on an exercise ball, went for a two kilometre walk with my ever-patient husband, but only felt period cramp-type pains in my back. I willed them to be contractions (even starting breathing techniques, though they really weren’t necessary), but my body had other plans. At 2pm, I was put on a drip of syntocin, and that was when the real magic began! The contractions came along quickly and intensely, and by 3pm, I was knee-deep in rolling contractions that rendered me unable to talk, and saw me frantically getting onto all-fours so that I could shove my back into my husband’s hands for a deep push on an acupressure point at the base of my spine. Our baby needed to be monitored, so I was hooked up to a machine, but was thankfully able to move around, as laying down simply would not have been an option. 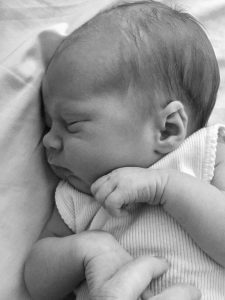 By 3:30pm I was in serious labour, so my angel of a midwife Margie suggested hopping into the shower – something I had been keeping up my sleeve until as close to the end as possible, as I knew it would likely be my last resort for natural pain relief. And right I was. The shower was heavenly, with constant pressure on my back (where most of my pain was being felt), and then a handheld nozzle across my belly when the contractions became most intense. I swayed through them, pushed water against my stomach, and tried my very best to breathe. I won’t lie – it was pure pain. I tried visualising and centring my breath, but when the contractions came on, all I could do was hope they’d soon be over. In the brief moments in between, I would think of Isaac and how I wanted him to be proud of me, and that I was about to meet someone who I’d love just as much as him. I’d been repeatedly asking Margie and my husband if I could really do it, and both answered a resounding “yes” every time. I was so grateful for their support and belief in me, as I know that if I’d heard a quiver of hesitation, I would have broken. Just as I’d begun announcing that I really could not do it, I began feeling the urge to push at the end of each contraction. It was a bizarre feeling; suddenly, I’d find myself squatting deeply and groaning. I’d proudly announced after birthing Isaac that I’d barely made a noise, but this certainly wasn’t the case this time around. I remember feeling like an animal, as I kept hearing myfriend Mel’s words in my ears to keep my lips loose (lips on my mouth for anyone who is wondering)! As the urges intensified, I moved to the bed on all fours, and began pushing. I’d read so many times that pushing is the ‘easy’ (ha) part, however I found it to be the most challenging. Our baby was posterior and in what seemed like every position, I experienced a shooting pain down my sciatica, and felt like my bottom was about to be ripped apart (probably because it was). Thankfully, it was at about this time that my obstetrician arrived, and promptly put me onto my side with my leg up in the air, so that she could manually turn the baby as I pushed, all while holding my bottom together. It was incredibly uncomfortable and I was squeezing my midwife’s and my husband’s hands so tightly that I am sure I left bruises (both were too gracious to tell me if I did) – insistent that the baby was not going to come out. My support crew were all sorts of amazing – telling me that I was making progress, and soon enough, that the baby’s head could be seen. When the baby crowned (and had successfully been turned by my wonder doctor), I flipped onto my back, gave a last few pushes (don’t be fooled – this was probably for 20 minutes), and finally, I reached down and helped my doctor to pull out my baby while his legs were being born, and brought him straight up onto my chest at 5:57pm. I’d say that the love I experienced at that moment was unlike any love I’ve ever felt before, but I’d be lying. It was exactly the same love that I’d felt three years prior when I delivered Isaac. Pure joy, elation, relief, and overwhelming, all-encompassing love. Not just for my baby (although he certainly took the cake), but for my husband, my midwife, my obstetrician, and for myself. 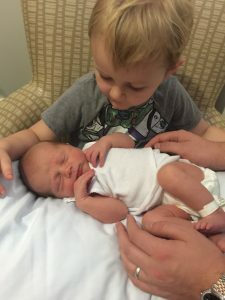 After birthing my placenta, receiving a few stitches and a few hours of skin to skin and breastfeeding, I had the life highlight of watching Isaac meet his baby brother Charlie (proving that he is the most delightful big brother that I knew he would be). I could get up, walk around and cuddle my angels immediately (something I wasn’t able to do after the epidural with Isaac). It was heaven. While I am so very proud to have birthed Charlie naturally (and owe so much of it to my incredible husband, midwife and obstetrician), I have been completely surprised at how I feel about both births. Having now delivered naturally, I do feel like a strong, warrior-style, incredible woman. Which is exactly how I felt following Isaac’s birth. Prior to having Charlie, I shamefully felt like a little less of a mother having ‘opted out’ of the full experience. However, now, I believe with all my heart that every birth, every baby and every mother is a miracle. Having pain relief or taking options that you need are nothing to be ashamed of – they’re there as options because we need them. If we’re lucky enough to be blessed with a third child, I’ll likely go the natural route again (I can feel my husband squirming from here), because I know I can do it. But if I needed an epidural or a c-section, I wouldn’t feel any less amazing about my baby’s birth. Regardless of how our babies enter the world, if they’re safe, healthy and loved, there is no ‘right’ way, and no ‘better’ way. My babies are the loves of my life, their births are some of the best moments of my life, and I simply could not be more proud to be their mama. Amy Malpass Hahn lives in Sydney with her three loves – husband Scott, and sons Isaac (3) and Charlie (brand new!). She is also the co-founder of The Ten Activematernity activewear and marketing consultancy The Communication Studio.